Hip joint pain can be caused by a wide variety of factors. Things like injury, infection, obesity and heredity are just a few. The most frequent cause of pain is osteoarthritis, mainly from the aging process, in other words, mileage. Information from the Arthritis Foundation reports that, to date, over 27 million people suffer from hip arthritis of varying degrees. Heredity can play an interesting role here, in that some families have a predisposition to develop arthritis in the spine, while others, the knee or shoulder, but for the most part, our culture and lifestyles are significant contributors to hip joint pain. 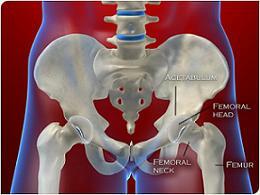 First, let’s talk about the normal hip, and what its major components are. The normal hip joint consists of the femoral head, or “ball” portion of the joint. The femoral head is the uppermost part of the femur, or thigh bone. It is round and covered with smooth, glistening cartilage called hyaline cartilage. Next is the acetabulum, or “socket” portion of the joint. The acetabulum is actually part of the pelvis and lies on either side of the pubic bones and below the part of the pelvis you can feel; the iliac crest. This, too, is covered by soft smooth glistening hyaline cartilage. The two parts together make for a little-to-no-friction "ball and socket" combination when the joint moves. For the most part, the hip joint is a very stable one and can support an awful lot of weight. It can move in many directions, allowing for movement of the legs in multiple directions. In addition to its inherent stability, the hip is further protected by an assortment of muscle, tendon and ligament attachments, which also serve to create motion in the hip such as flexion (bending), extension (straightening) and rotation. One of the most common causes of hip joint pain is osteoarthritis . Like any other joint, degeneration of the hip can be caused by such things as injury, obesity, genetics, systemic use of steroids (i.e. for serious medical conditions) or infection. In the case of hip osteoarthritis, the femoral head can lose some or all of its smooth cartilage surface, becomes abnormally shaped and can develop bone spurs around its edges, hampering movement and causing pain. Similarly, the cartilage can become severely worn down in the socket(acetabulum). Bone spurs often form around the edges of the socket causing further pain and mobility deficits. In severe cases, even the most minimal movements can cause significant pain. Other major causes of pain can include hip fracture and hip bursitis .